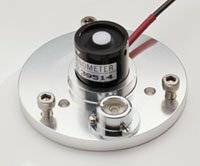 This precision Solar Radiation sensor or pyranometer includes a bubble level, leveling screws and mounting hardware for easy installation. This Solar Radiation sensors use a high stability silicon photovoltaic (PV) detector (blue enhanced) to obtain accurate readings. The solar radiation sensors are attached to 25 ft of marine grade cable, with lengths up to 500 ft available upon request. The pyranometer's output is 4-20 mA with a two wire configuration. The PC320 Solar Radiation Sensor Controller uses the solar radiation sensor's output to trigger alarms. In addition, it offers the GL500 Solar Radiation Recorder, which adds recording capabilities to the solar radiation sensors. The GL500 Solar Radiation Recorder connects to the pyranometer's 4-20mA output to record data. Atmospheric circulation is driven by solar radiation. Determining the solar radiation and its interaction with the atmosphere and the Earth's surface is important, since solar radiation accounts for almost all of the energy available to the Earth. There are two ways solar radiation reaches the Earth's surface. The first is direct solar radiation where the solar radiation is directly transmitted throug the atmosphere. The second is diffuse solar radiation where the incoming solar radiation is scattered or reflected to the Earth's surface. Almost 50% of shortwave solar radiation is absorbed by the Earth's surface and changed into thermal infrared radiation. Direct solar radiation is measured by using solar radiation sensors or pyranometers. These type of solar radiation sensors have a transparent hemisphere which measures the total amount of shortwave solar radiation. Solar radiation sensors or pyranometers measure the total radiation or sum of the direct radiation and the diffuse solar radiation. Note: Sensor mounts to a vertical 1 inch tube. Standard solar radiation sensors include 25 ft of cable, but can be purchased with up to 500 ft of cable. Solar Radiation recorder for sensor datalogging. Includes Global Logger Software. With weather proof enclosure and 12V battery. This system is designed for remote monitoring sites. This system is designed for integration with existing SCADA, PLC, or RTU systems. LCD readout display for both portable use and permanent installations.